The UC San Diego swim and dive team competed at the Canyonview Aquatic Center in San Diego on Tuesday, Jan. 2 and Wednesday, Jan. 3 while celebrating its senior day which recognized 16 seniors. The Tritons competed once again on Saturday, Jan. 6 against Loyola Marymount University and Cal State Bakersfield at LMU where the women defeated Bakersfield, 191–109 and the men won 150–144. Against LMU, who does not have a men’s program, the women won in convincing fashion, 253–41. The women’s team defeated the San Jose State University Spartans, 152–148, in their first matchup on Jan. 2, but fell to them, 146–153, on Wednesday, Jan. 3. The men took down the University of the Incarnate Word, 151–138. The first day against San Jose State University, the men’s team placed first in six out of the 14 events including the 200 Medley Relay as well as the 200 Freestyle Relay. The Tritons finished the Medley Relay in 1:33.36 through top performances by freshman Tyler James, sophomore Edgar Chin, senior Kevin Wylder, and sophomore Sawyer Farmer. Additionally, Chin placed first individually in the 100 Breaststroke and Wylder in the 100 Butterfly. The women racked up eight of the sixteen events and, while the lady Tritons placed second in both the Medley and Freestyle Relays, key performances from sophomore Kaitlyn Ritchey who placed first in both the 1650 Freestyle and the 500 Freestyle allowed UCSD to fully take down the Spartans. While the Tritons’ senior day left the team in high spirits, the following day proved to be less of a celebration as the women’s team was unable to defeat the Spartans in its second match up. The Tritons managed to obtain seven first-place finishes; however, it was not enough to secure the victory. Freshman Rachel Taylor held the most notable performance as she finished first in three events including the 100 Breaststroke, 200 Breaststroke, and the 200 Individual Medley. Additional key performances came from Ritchey, who once again stole the show for long distance swimming, finishing first in the 1000 Freestyle. However, the Tritons were unable to find success in the final Medley Relay, finishing second at 3:30.33 to the Spartans’ 3:30.19, and ultimately losing, 146–153. The Tritons were ready to avenge their loss at LMU where the men won nine events including the 200 Medley Relay, in which they barely scraped by the Roadrunners, coming in at 1:32.80 to Bakersfield’s 1:32.96. Senior diver Trevor Jackson placed first, scoring a final score of 283.95 far exceeding his competitors scores who finished at 232.05 and 228.85. The women faired equally as well, taking 11 of the 16 events. Taylor remained consistent, dominating once again as she once again won first in 200 Breaststroke and 200 Individual Medley. Additionally, two seniors made their marks individually as captain Haley Murphy placed first in 50 Freestyle as well as in 100 Freestyle and Angie Phetbenjakul in 100 Breastroke. The victories at LMU moved the men to 3–1 overall and the women to 6–3 overall. 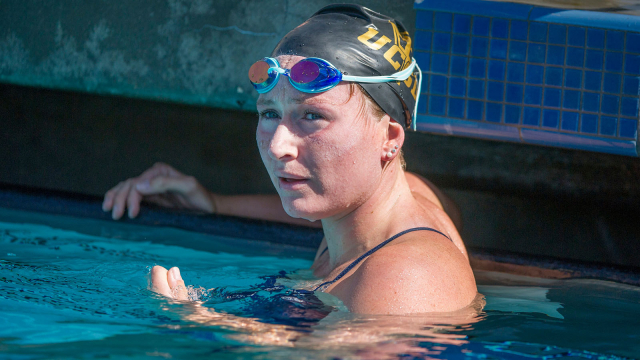 The UCSD swim and dive team will take on Cal Baptist University on Saturday, Jan. 20 in Riverside.